Katie and I have shifted things around just a little bit so we could add in a post about swim cups. Thanks to both Katie and Dixie from DixieDIY for talking a couple of things over with me as I prepped this post. You’ve noticed that we’re pulling a lot of resources from other blog posts. Basically, if it’s been done and done well, we’ll link to it. So, today I’m pulling together a handful of links plus some of my own photos to show you how to choose your swim cup size and install them into your bather. First I’ll show you the swim cups in my RTW tankini. 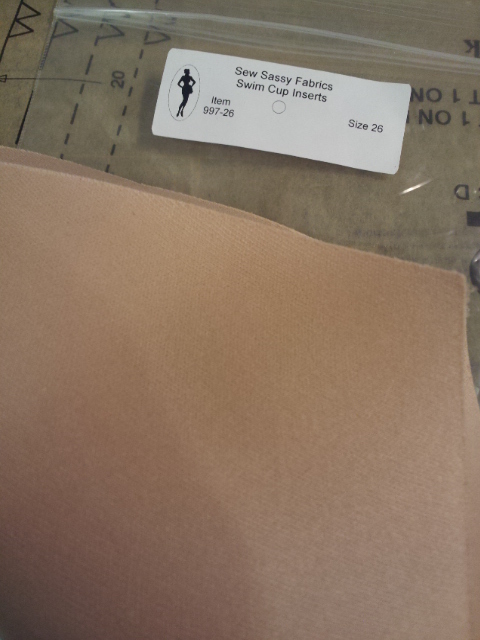 From what I’ve found, swim cups provide no support, only minor shaping and modesty. If you’re going to install swim cups, it’s for a shelf bra. Just keep in mind that for support you’ll need a wide elastic under the bust and really supportive straps. The straps on my RTW tankini are far from supportive so the look I get is awful…and yet, I’ve worn it in public. Just go to the size bra that fits you the best and walk your way diagonally up your cup volume until you land on something close to a Sew Sassy size. If you’re still not on the chart, get the largest cup you can. If you need to, you can always trim it down. 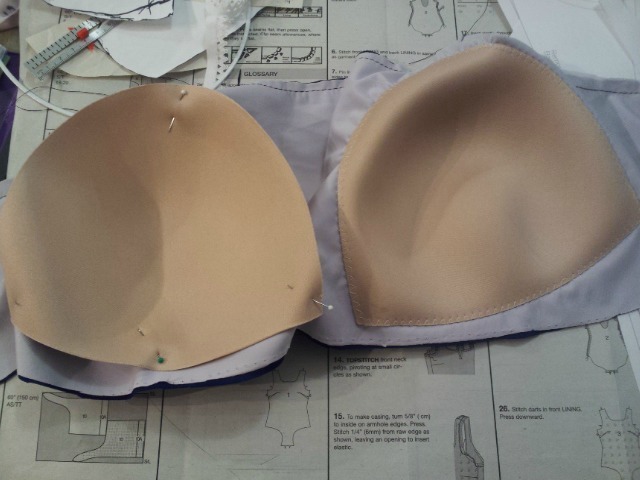 Since you won’t get real support from this method, you just want to make sure you it covers the front of your breast tissue. You don’t have to worry about it wrapping all the way around to the side. I’ll keep using myself as an example. I started at 32GG and went up diagonally along Cup Volume 8. I got as far as 38F. Sew Sassy cups only go to 38C so I kept going up what I can see is the pattern of my cup volume to 40E, 42D, and finally 44C. You just increase one band size and decrease one cup size. The biggest they chart is 42C so I got it and it worked. It covers the majority of my breast tissue and the bather will do the rest of the work. I also bought poly laminate foam in case I wanted to make my own cups and now that Norma showed us how to make a foam cup underwire swim bra I’m glad I got it. To make my shelf bra pattern, I started with a layer of swim lining. My pattern had a piece to cut out specifically for the shelf bra but if yours doesn’t just take your front piece and cut the strap down so that the new nubby of a strap is about 5″ lower than the front piece. Take in the side seams by about 1/2″ or less. You just want it a bit smaller but not much. The length of the shelf bra liner should be as long as the length of your body (including bewbs, of course!) from shoulder to your underbust, or where your underwire sits, minus the 5″ or so inches you took off the shoulder strap. Add 1/2″ seam allowance to the underbust so you can attach your elastic and turn it over and add as much seam allowance as you want to the sides. Armholes and neckline should line up with your bather. Here’s one cup zigzagged in place and the other pinned into the lining of my bather. Actually, it’s two layers of lining because the lining I bought isn’t that good- not enough spandex I think. Then, I zig zagged elastic to the bottom (use a wider elastic for more support), flipped it up and zig zagged it again. My straps need some serious engineering before this will hold me in the way I want it to but it’s a start. Bra style straps might be the best way for me to go. Once the lining had the cups attached, I basted the armholes and neck of the lining and the outer swim fabric together to prep it for elastic. Check out Dixie’s method which was to put her swim cups in between two layers of swim material. Excellent! And a tutorial Dixie links to in her post from CraftStylish on how to install the swim cups. We’ll soon resume with some more swimalong goodness. You know where to find me if you need help. I’m holding off sewing my swimsuit until the Bombshell swimalong but these posts are fantatstic! I’ll be returning to them again and again. You guys are really killing it with your posts. I also consulted swimsuit Yoda, aka Dixie, about cups. Trying to figure out the best way to add support to the Bombshell for the swimalong. Expect a lot of cross-linking since there is so much overlap…. I’m glad you’re liking the posts. Dixie totally is the swimsuit Yoda! I’ll be listening in on support for the Bombshell. Definitely.